A lightened up shrimp scampi? Yes, please! 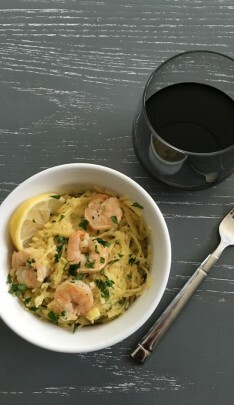 This dish, created by Jen Valencic from Avon, Ohio, uses no butter and replaces starchy noodles with spaghetti squash. The flavorful sauce combines zesty lemon, tangy Dijon mustard, spicy red pepper flakes and creamy Greek yogurt. It’s so lean, you can even go back for seconds! Season spaghetti squash with salt and pepper. Roast squash, cut side down, on a baking sheet coated with olive oil, for 45 minutes, or until tender. Heat olive oil in a large skillet over medium heat, and sauté shrimp and sliced leeks until shrimp is cooked through, about 3 minutes. Add garlic and sauté for additional minute, set aside. Add lemon juice, zest, wine, dijon mustard and red pepper flakes to pan. Bring to a boil and then let simmer on low. Remove from heat and whisk in yogurt. Once squash is tender, remove from oven and let stand for 10 minutes. Scrape out all strands of spaghetti using a fork and place in colander in the sink. Blot with a paper towel to remove excess liquid. Toss sauce with spaghetti squash strands in serving dish. Add shrimp and leek mixture. Garnish with fresh parsley and parmesan cheese. Serve hot.